Kick off the climbing season! June 1, the community will gather in the home of the American Alpine Club for a festival celebrating all things climbing. Complete with carnival games, tours of the American Mountaineering Museum, an open air vendor village, food trucks and local beverages—the Excellence in Climbing Celebration has something for everyone! The highlight is inducting inspirational climbing heroes into the Hall of Mountaineering Excellence. The 2019 honorees will be announced soon! While it’s an opportunity to celebrate, the Excellence in Climbing evening also serves to raise funds vital to the two organizations in the United States charged with preserving climbing history: The Henry S. Hall American Alpine Library and the Bradford Washburn American Mountaineering Museum. Established in 1916, the AAC Library has long been a launchpad for expeditions, a place to share stories, and a resource to inspire the future and protect the past. 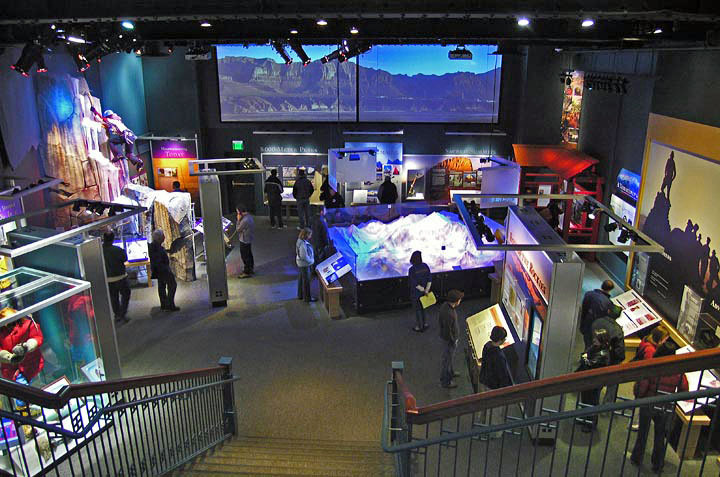 With the addition of the American Mountaineering Museum in 2009, these artifacts found a home where anyone — from the most seasoned Everest climber to the third-grader with her first harness — can soak in the stories of the past. Event proceeds benefit the library and museum. Kids under 10 get in FREE! Includes access to the Block Party, plus 1 drink ticket. Includes access to the Block Party and Presentations including Kelly Cordes keynote, plus dinner, 1 drink and 3 game tickets. An easy way to support the Museum and Library, the Patron Supporter is an opportunity for you to help preserve and share climbing history. Includes access to the Block Party, Presentations, and Patron Reception. Also includes dinner, 2 drink and 5 game tickets, slideshow recognition, and VIP seating for presentations. Two highly accomplished climbers from a different backgrounds will be inducted into the Hall of Mountaineering Excellence. Inductees come from all disciplines; mountaineering, rock, ice and mixed. Inductees have had a significant impact on climbing history, but have also made contributions of meaning in other areas relating to the mountains and their vibrant communities. The multi-dimensional inductees have made lasting contributions in the areas of culture, environmental responsibility, community, the arts and sciences. And now we celebrate the sense of teamwork and selfless giving these amazing people have demonstrated! Laura Waterman - As a climber, conservationist and author, Laura Waterman climbs and writes about the mountains. Together with her late husband, Guy, the Watermans’ authored books covering climbing, hiking, environmental ethics, and mountain history. In 2002, Laura founded The Waterman Fund grants program to support trail work, stewardship, education, and research. Ken Yager - Ken Yager, a climbing guide and founder of the Yosemite Climbing Association loves Yosemite. In 2004, he started the Facelift, a non-profit responsible for removing over 1 million pounds of garbage from the park. The event continues to be the largest volunteer cleanup in park history. Thank you to these volunteers for giving their time and expertise to help identify and recognize the Hall of Mountaineering Excellence Inductees. "The word hero gets thrown around a lot in climbing. But as impressive as summiting K2 or bouldering V15 might be, the genuine heroes of climbing are those whose achievements help make the world a better place..."
"It was a giant stepping stone,” said Libby Sauter, the award recipient and also the keynote speaker of the night. Sauter is the youngest climber to be added to the Hall, and only one of five women in its history, since the club’s birth more than a century ago..."